So I’ve been nominated for a couple of blogger awards just recently! I can’t explain how happy this made me 🙂 It is a show of the wonderful nature of the blogging community. I was so apprehensive about starting a blog and I have been overwhelmed by the support and encouragement that everyone in the blogging world gives to each other. These awards are further examples of the great community I’ve joined and been into welcomed with open arms. So the first nomination came from Evgenia who has a lovely blog called Living On Annette (make sure you go check it out!). 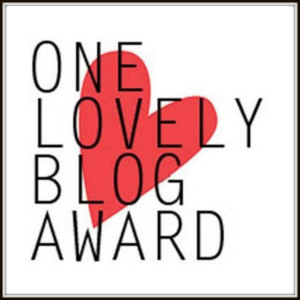 Evegina nominated me for the One Lovely Blog Award 🙂 A massive thank you for thinking of and nominating my blog! 1. I am incredibly close with my wonderful family. There is a saying that “you can choose your friends but you can’t choose your family”; well I’d choose my family as my friends every time! Love you all. My wonderful dad, mum and brother! 3. I’ve been given the honour of being a bridesmaid and wedding cake maker for one of my closet friend’s wedding next year. I cannot wait to spend the day celebrating her big day! 4. I was diagnosed with Ehlers-Danlos (EDS) Type III in 2013. This is a syndrome which affects the connective tissue in my body. The problem is cause by a collagen problem meaning my joints are loose and bend further than they are supposed to. To help control the affects of this, I have spent the last year trying to improve my health and I’ve even joined a triathlon swim club. 5. 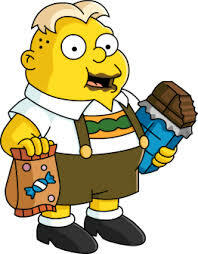 My brother nicknamed me ‘Gunter’ after the fat German exchange student in the Simpsons and its stuck! My 21st birthday watch even has the name engraved on the side. 6. For my first birthday with my boyfriend Dave (back in 2008) he bought me Despicable Me on DVD and frozen chicken pies 🙂 Yep, frozen pies as a birthday present is a little unorthodox but I thought it was great. 7. My nan used to tell me she was a witch and I believed her. She even planted a broom in the garage whenever she would visit so I thought she arrived by flight. Me and my nan at Christmas this year. The second nomination has come from Plan B Chronicles. Again, be sure to check out the site and a great big thank you for the nomination. 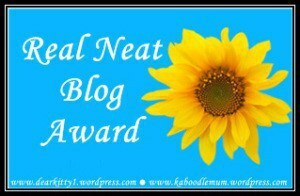 Plan B Chronicles nominated me for the Real Neat Blog Award. Answer 7 questions asked by the person who nominated you (my nominee snuck in an extra question just for a bonus 🙂 ). 1. What are you hobbies? My biggest hobby will probably come as a great surprise to you all! Only kidding, its cooking and baking! 🙂 Other than that, I love to read, swim, watch films with Dave and spend time with my friends and family. Florida! More specifically Walt Disney World and Universal Studios 🙂 Each visit has been the best holiday and it is definitely my happy place. 3. Who has been the most influential person in your life and why? There isn’t just one, it has to be both my mum and my dad. They have influenced me in different ways but most importantly they have shown me the importance of having a good work ethic, never letting anything stop you from achieving your goals, always pushing yourself, enjoying everything life has to offer and the understanding that happiness and laughter are vital to having a long and happy relationship. Thank you for everything you have taught me and for all that you have done and continue to do for me. Love you! A city called Peterborough in Cambridgeshire, UK. I lived in a village which had the city on one side and the countryside on another. There wasn’t always a lot to do but it was home. My parents and brother still live there and I have a handful of close friends who I try to visit on a semi regular basis. 5. If you could change one thing about your appearance, what would it be? With my love of all things food, it would be nice to loose a little weight. I’ve always struggled a bit with my weight and ever since I was diagnosed with EDS, my health and fitness has become very important. About a year ago, I started to eat healthier and exercise more regularly. I’m 20lbs lighter than when I started and in such a better place but I still have a few more to go before I reach my goal weight. Life is however short and I don’t believe in denying myself the things I love. The last year has been about taking control and it has become clear that everything in moderation leads to a more beautiful and happy life. I don’t have any personally but my mum and dad got a dog when I was 15. A beautiful golden cocker spaniel called Casey and I absolutely love him to bits. He’s getting old now but he’s still as full of energy and love as he was the day my parents brought him home. His wagging tail and floppy years are enough to soften even the hardest of days! 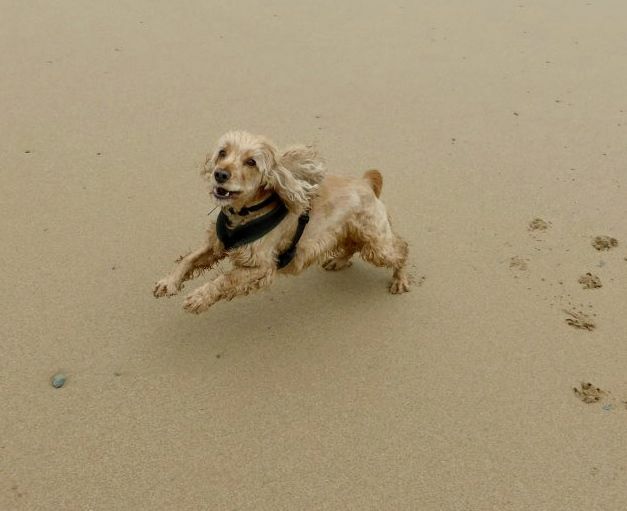 Casey on his annual holiday to Cornwall. 7. What do you usually do on Sundays? 8. What is your favorite food to cook? Recipe? There isn’t really one type of food that I enjoy cooking more than others. There is one which I enjoy eating the most and that is definitely a roast dinner! My favourite dinner of the year is definitely Christmas dinner which is the ultimate roast. I’ve not hosted Christmas yet and the closest I get is the occasional sunday roast. Coming shortly in Challenge 52, I’ll be sharing the recipe for a cola, maple-glazed roast ham. Be sure to come back to check out the recipe. How did you get involved in blogging? If you could only eat one dish for the rest of your life, what would it be and why? If you had a dinner party and you could invite any 5 guests, dead or alive, who would you invite? This entry was posted in Extra Adventures and tagged Award, Baking, Challenge52, Food, Good to know, Lovely Blog Award, Real Neat Blog Award, Recipe by MyGastroAdventure. Bookmark the permalink. Thanks Vanessa for the lovely nomination – give me a few days to turn my post around!